It’s a horrible irony that by the time many women consider preserving their fertility by freezing their eggs they are already too old for it to be a viable option. ‘Social’ egg freezing (or oocyte cryopreservation) is a young woman’s game but the ideal candidates are likely to be actively working against getting pregnant, the notion of having a baby a far-off, vague, and perhaps slightly terrifying one. There is always the belief that things will work out - there will be a right time, the right partner, and the baby will arrive, and for many women that is the case. However, for others it is not. In Ireland, the fertility business is booming as one in six couples now experience problems conceiving. The reasons are myriad, but for many women it simply boils down to age. Socially we’re not ready to start our families until later in life, but our biology remains depressingly predictable – our fertility drops dramatically from the age of 35. There are two main reasons, both egg-related: diminished ovarian reserve (we are born with thousands of eggs which deplete over time, significantly from 35), and egg quality, which also takes a nosedive from 35. By the time a woman is in her forties 80 per cent of her eggs will have a chromosomal abnormality. Dr John Kennedy, medical director, SIMS IVF, Dublin, explains, “The main issue when it comes to egg freezing is you do not know if the eggs you’ve frozen are any good or not until you try to turn them into embryos and then turn them into pregnancies. The process of egg freezing or ‘oocyte vitrification’ involves stimulating the ovaries with drugs to produce eggs. Some women will require one or two cycles. Others with reduced ovarian reserve may require three or four to collect the same number of eggs. Once the eggs are retrieved they are vitrified or ‘flash-frozen’. This process avoids the formation of ice crystals and damage to the eggs. Even so, whatever your age at the time of retrieval, 10-15 per cent of those eggs will die during the thawing process. Unfortunately, half of the women who approach SIMS about egg freezing are already 35 and over. It’s the same story at Beacon Care Fertility IVF in Sandyford, Dublin. Dr Bart Kuczera of Beacon says it's "more than half" and adds, “They’re coming in too late – in their late thirties. It’s not uncommon to see women in their forties. But they need to come much earlier. Most of the older women enquiring about the process at Beacon are single and have simply not yet met the right partner with whom to start a family, says Dr Kuczera. One patient, he says, was in a relationship but her partner was not willing to start a family at that point in time. When dealing with older patients in this context at SIMS, Dr Kennedy says it’s about managing expectations. “If somebody comes in at 38 wanting to freeze their eggs, it’s a little beyond my remit but I try to have a general conversation about what are their hopes and expectations for the next year, two years, five years? “They’re generally single at that point in time but is their plan to meet somebody and start a family and in how many years? Maybe they’re coming in relatively cold and they don’t understand their fertility is already decreasing and that if they want to have children now is the time to have children because they’re not going to have that option in a year or two. Fertility preservation isn’t on the cards for them. 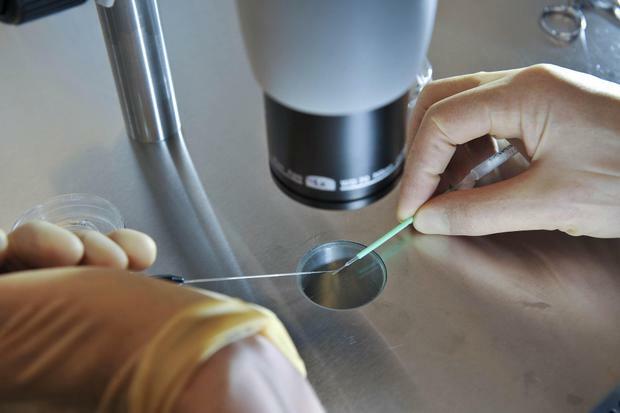 IVF and artificial insemination concept. Woman is injecting hormones to belly with syringe. However, despite being advised that the odds are against them, some women in this position still embark on the process. It’s like playing the fertility Euromillions - if you’re not in you can’t win. “I have had people who have gone through egg freezing when it wouldn’t necessarily have been my preferred option,” says Dr Kennedy. “But they’ve been appropriately counselled and they’re fully away and cognisant of the pros and cons. He adds, “Fertility preservation is a wonderful idea in principle, the notion that you can defer this until you’re ready is incredibly powerful and incredibly important but really it’s not generally applicable to older women and they’re a significant proportion of the women who are looking for it,” he says. While egg freezing is a young woman’s game, however, it’s generally not one they want to play - or have even considered playing. “Women are focused on their careers, their education, and indeed finding the right relationship before they settle down to have a family and that’s really appropriate behaviour and it’s not going to change,” says Dr Kennedy. A simple AMH (anti-mullerian hormone) blood test is a good indicator of ovarian reserve and how fertile you are compared to your peers of the same age. If it’s lower than average and you find out sooner rather than later you have choices. Egg freezing is one. It is, effectively, insurance. However, while you may claim on your insurance, the pay out – ultimately, a baby – is not guaranteed, especially if you are older. And, of course, like any insurance, there is a hefty cost. It varies but generally initial egg retrieval – effectively the first stage of IVF - and freezing for the first year will set you back around 3000 with an added 300 or so per year thereafter for storage. Most women will never use those eggs. Some will meet a partner and try to have a baby naturally first. But if they do embark on the second stage of IVF they will pay another 2500 to 3000. “The idea is to freeze these eggs and then go away and not worry about it too much and they’re there if and when you need them,” says Dr Kennedy.